These recommendations for personal clothing and equipment will ensure that you have a comfortable trip under any weather conditions. Trips in the spring and fall, or during cold, rainy weather, may require the protection of a wetsuit or rain gear. Warm summer trips are pleasant in shorts, T-shirts, swimsuits, and secure river sandals or tennis shoes (no flip flops or socks). Always prepare for cool, rainy weather and when dressing for warmth, think synthetics and avoid cotton (no jeans or sweats). Bring a dry change of clothes and shoes to wear after the trip. *All Inclusive* Includes tent, sleeping bag, and sleeping pad. On one day trips, Oregon Whitewater Adventures will provide waterproof day bags for carrying your personal items such as sunscreen, camera, extra clothing, etc. 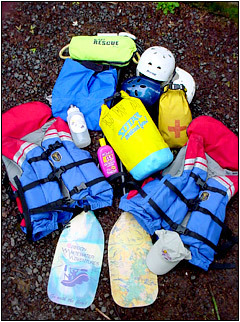 On overnight trips on the Deschutes, Owyhee, John Day, and Grande Ronde rivers, each rafter is provided with a large waterproof dry bag for personal belongings. This bag has about the same capacity as a very large backpack. Overnight trips on the McKenzie and Umpqua do not require dry bags, as camping gear is not taken on the river. Day bags are always available and assure access to items needed on the river. Feel free to call us if you have any questions about getting ready for your trip.